Alcohol use, as an age-old aspect of human society, is something that has ended up being practically as popular as breathing in and out. As a so-called feel-good drug of choice for countless people. Wine O Clock is becoming an everyday part of many people’s lives, but alcohol and weight loss mix like oil and water! Nevertheless, booze’s well-documented unhealthy impacts: Decreased efficiency at work, depression, addiction, diabetic issues, and liver disorders to differing levels in specific people, might be viewed as a great justification to stay away from it. This being said, lots of people are using alcohol to ‘cope with life’ and it does play a part in a lot of our customs and practices. One impact drinking has, which is not extensively talked about, is its effect on body fat. In its purest format, ethyl alcohol, which provides 7-8 calories per gram, booze provides energy, spiking up your overall energy intake any time it is used. In contrast to macronutrients like carbs, healthy proteins, and fats, drinking supplies what nutritional experts frequently describe as empty calories: calories with no nutrients. To make matters even worse, it is the initial energy to be burned when incorporated with carbs, fats, and proteins, delaying the fat-burning activity and adding to higher body fat stores. Alcohol, any time consumed, is the initial fuel to be burned. At 7 calories per gram, drinking offers almost twice as many as protein and carbohydrates. As a matter of fact, booze has only 2 fewer calories than fat, that has 9 per gram. It should also be kept in mind that the calories in booze miss the vitamins and mineral advantageous for a healthy and balanced metabolic process and will, for that reason, speed up body fat stockpile. Drinking is very deceitful because it goes through the body quickly. Typically before you even got the chance to take note of the number of alcoholic beverages you have had. Alcoholic beverages also incorporate calories from other origins, that contribute to the general caloric consumption. Particularly mixed drinks and cocktails, for instance, have a lot of fat in them. Red or white wine and lager both have an elevated carb content. Even though the impacts these numerous calorie types have on the human body are varied. Carbs lead to the release of the hormone insulin. Insulin speeds up the fat storing process, even though fats will be saved specifically in the fat cells, the general outcome is boosted body blubber. A glass of wine is similar to eating a chocolate bar! An illustration of the number of calories may be effortlessly drunk may be observed with a little glass of red or white wine: a 5-ounce glass of wine will generally consist of 110 calories, 91 of which stem from the booze itself (13 grams), with the lingering 5 grams stemming from carbs. Lager features even more carbs (though a lot of the “Lite” drinks have a carbohydrate composition much like a glass of red or white wine) and reduced alcohol than wine but is considered as being more unhealthy, because of its greater energy composition. 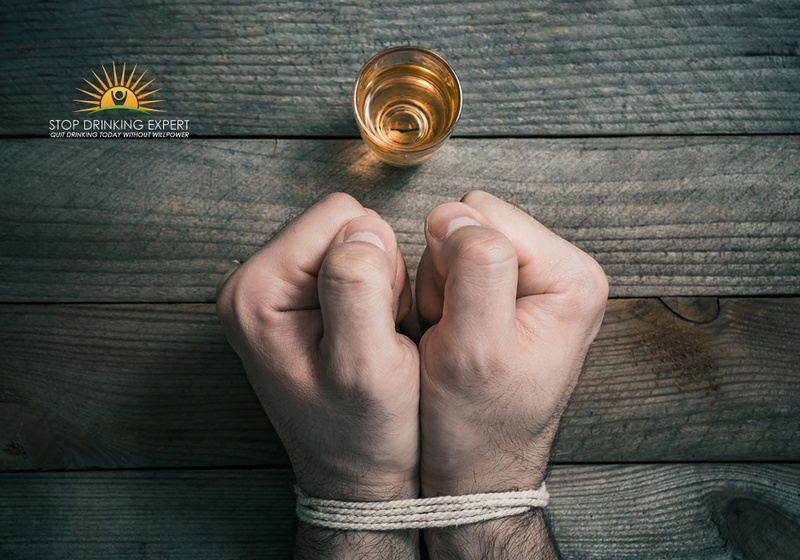 When drinking alcohol, folks typically will not pause to think about the consequences drinking is having on their bodies; such is booze’s impact on weakening the self-consciousness. The outcome of this softened reasoning might guarantee even more calories consumed and additional body fat gains. 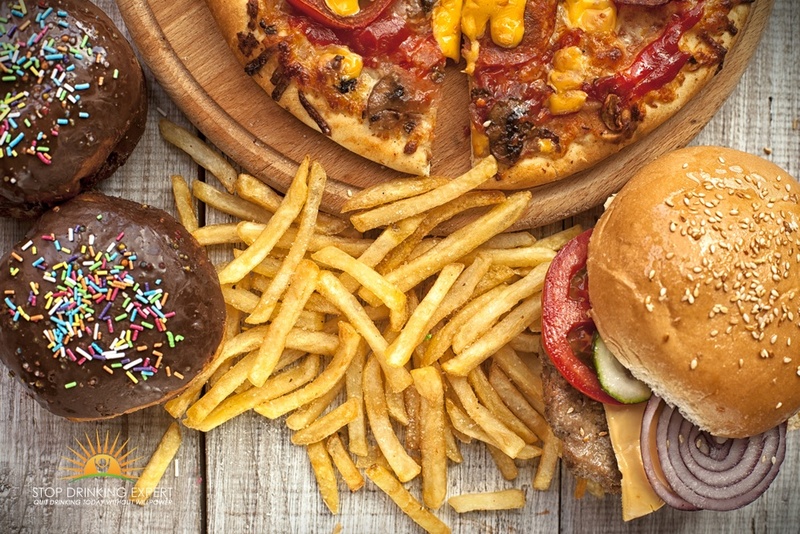 People drinking alcohol may also consume more junk food, without considering the repercussions. Drinking has the tendency to feature an appetite-stimulating consequence as it supplies very little in the way of nourishment, leaving behind a yearning for other foods items at the moment of use. Add this to the fact that oily and oversalted foods items have the tendency to go along with most events including drinking (in addition to booze encouraging person’s hunger for these type of dishes). 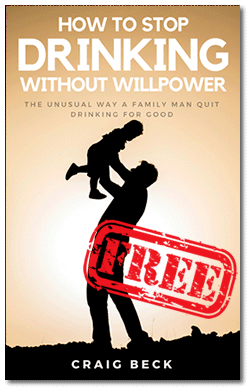 Add this to the overall loosening of willpower that goes with an intoxicated frame of mind, and you have a formula for extra body fat growth. Given alcohol is a byproduct of yeast assimilation; it may have a troublesome consequence on the lining of the gut and slowly deteriorate the renal systems and liver, resulting in severe health issue, even loss of life in particular circumstances. Any deterioration of the gut will reduce the rate and effectiveness at which food is absorbed. This eventually disrupts a healthy and balanced metabolic process and the weight reduction activity. The liver, which handles poisons and burns fats for energy, is essential when it concerns keeping a well-balanced body composition. Drinking is at its most harmful throughout the liver’s detoxing procedure. Testosterone, which has a strong weight loss impact, is lowered any time booze is used, therefore suspending its full power as a body fat burner. Additionally, testosterone as an anabolic hormonal agent, adds to increases in healthy muscle tissue mass. Reduced testosterone level implies less muscle mass gains, and thus a reduced metabolic rate. For men, it can also lead to ED and impotence! A reduced metabolic rate will make the task of dropping body fat even more difficult. This is what regulates the way we make use of energy. People with a greater metabolic rate will shed more calories at rest. 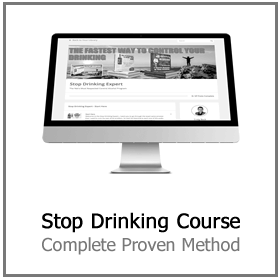 By disrupting testosterone creation, alcohol in a roundabout way triggers the system to reduce its metabolic rate. This directly restricts testosterone from applying the full level of its fat-burning benefits. Discussed quickly in point 2, drinking can amplify hunger, making the mix of drinking and an unhealthy meal even more severe. A Canadian report revealed that drinking used prior to a meal raised caloric ingestion to a significantly higher degree than did a carb beverage. Analysts from Denmark’s Imperial Veterinarian and Agricultural University demonstrated that if a bunch of males was offered a meal and allowed to consume as much as they wanted, alcohol, instead of a soda, would raise the quantity of food eaten. How Is Alcohol Handled In The Human body? To acquire an awareness of the reason that drinking impacts us the way it does, it is essential to recognize how it is handled in the human body. The quantity of food in the abdomen (a fuller belly reduces the rate of absorption). Whether the drink is carbonated (sparkling wine is assimilated faster than non-sparkling beverages). The alcohol concentration of the beverage (higher alcohol beverages are assimilated quicker). 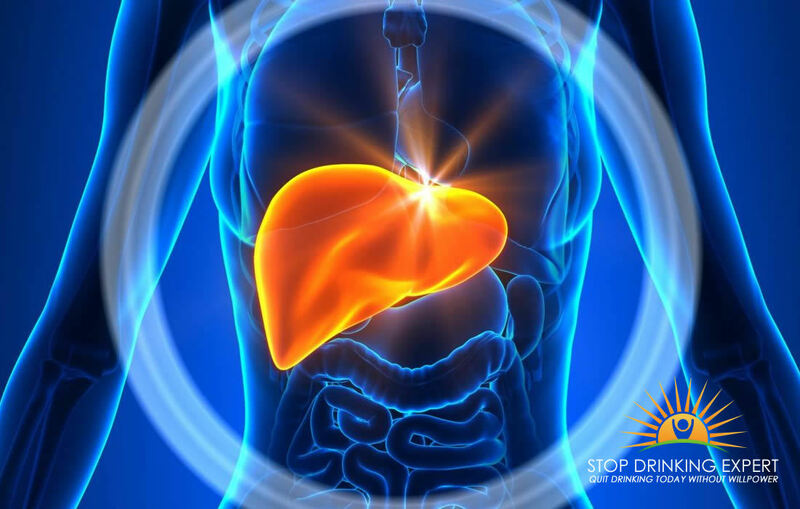 About 98% of alcohol that is drunk is dealt with in the liver, with the other 2% to 10% being eliminated through urine, respiration, and perspiration. The quantity of alcohol in a regular alcoholic beverage will take about TEN hrs for the typical individual to process. 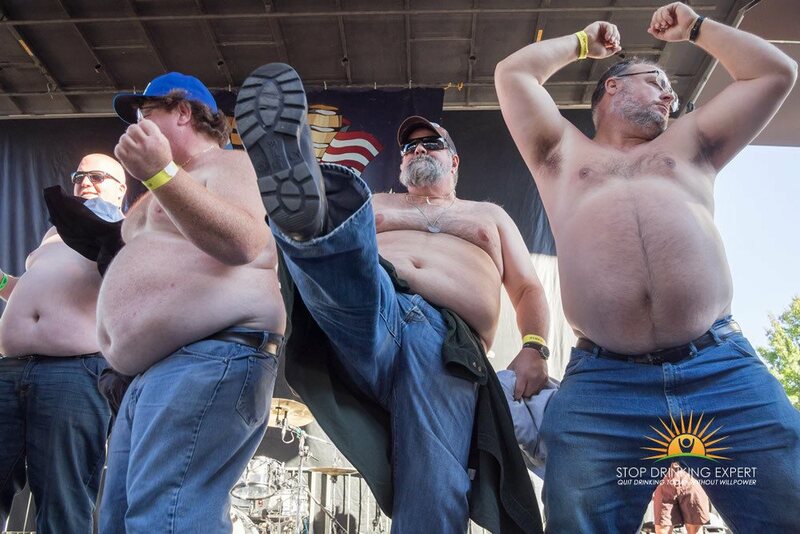 This, in turn, implies the more that is drunk at any one sitting, the higher the surge in blood alcohol content. 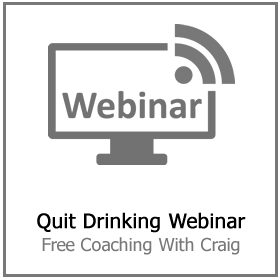 Is it becoming more clear why alcohol and weight loss are not good bedfellows? When the liver deals with alcohol, it does this in a couple of ways. Generally, alcohol is digested by the chemical alcohol dehydrogenase (ADH, which is held in the liver tissues). 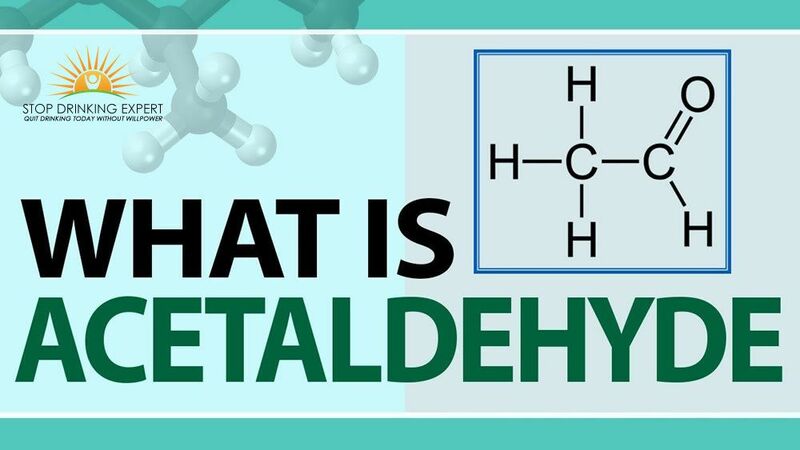 ADH then metabolizes the alcohol into acetaldehyde. Acetaldehyde is dissolved into acetate by one more chemical, aldehyde dehydrogenase. In the final phase, the acetate is further metabolized to where it ultimately leaves the system as waste products, co2, and water. About 98% of booze that is drunk is dealt with in the liver. “It is best not to drink alcohol in any quantity from any source. Booze is a byproduct of yeast metabolism (basically we are drinking yeast pee) and is understood to harm the gut, renal systems, and liver. It is practically inconceivable to consume alcohol and abide by the hunter-gatherer diet and lifestyle. If you are on a diet and hoping to shed some of that fat hanging off your hips, bum, and tum. 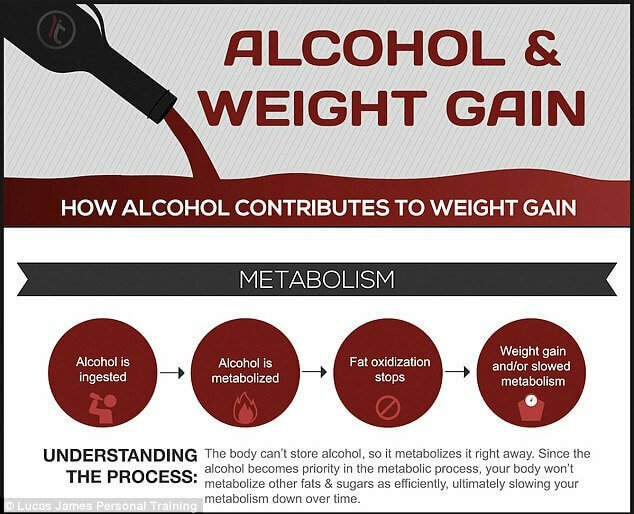 The bad news is alcohol and weight loss simply don’t sit well together. 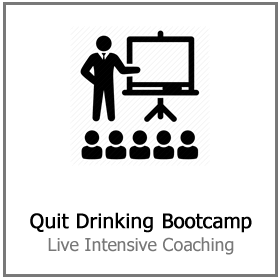 The good news is quitting drinking makes losing weight so much easier. 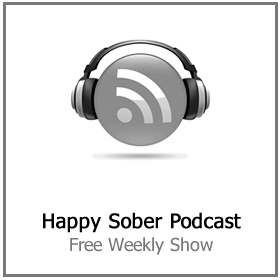 Plus you will get all the other amazing benefits that come with living a happy sober life. Easier said than done? 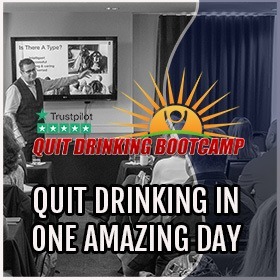 Not really… click here to find out how easy it can be to quit drinking for good.